Those who are holding off buying the Tocco Lite for a more colorful version, such as the Samsung Genio Touch well, you're in luck because you don't have to wait much longer. 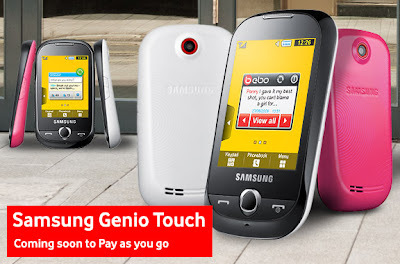 It looks like Vodafone will be releasing the Samsung Genio Touch mobile phone sometime in October. And even more good news, not only is it cheap, but it will be available on Pay as You Go.